Great Quality Office Cleaning- A Headache Remedy! “Sheila, a facilities manager for a Massachusetts commercial property company, contacted Apple Corps’ office in a panic. Feeling distressed, worn out, and frustrated.. all from cleaning. Cleaning!? How could cleaning make someone feel all these uneasy emotions? Apple’s customer service representative talked to Sheila about the frustrations she had been encountering the past few months. It all began with the dusting. She admitted that the building’s new interior design aesthetic was dust-layered surfaces bedazzled with cobwebs and dirt. This was not something Sheila had planned on. It was apparent the building tenants did not approve of this new dirty look either. Even worse, was that she was paying every month for cleaning services that were not happening. Dusting was to occur on a weekly basis in her facility, and the cleaners were ignoring the task. When she called her cleaning company to let them know that the dust was a major problem, they did not return her phone calls or emails. After two weeks of complaining, Sheila had finally got a hold of her cleaning company. They said they would fix the dusting problem. However, the issue was not getting better. Locked into a contract, she felt stressed and annoyed. The ongoing complaints were making her job more stressful, and some tenants were even threatening to move out of the commercial building. Feeling trapped and no way out, a signed paper was preventing her from cancelling this cleaning service. As the days went by, more cleaning issues began to arise. Restrooms being the biggest of them all. The work facility tenants would email and call Sheila every day expressing their disgust of dirty toilets, urine stained floors, and bad odor; Setting Sheila over the edge. Sheila started looking for new options. After some online research, she found Apple Corps, a 35 year old family owned Massachusetts commercial cleaning business. She reached out to them for some help. Apple Corps’ customer service representative listened to Sheila’s needs, and defined how their company could remedy the issues Sheila had been experiencing with her previous company. What differentiated Apple Corps cleaning from her last company was their professionally trained staff, high quality cleaning, supervision programs, excellent customer service, and no long term contracts; All traits of a great cleaning company. Are you experiencing complaints from your tenants about the quality of cleaning? 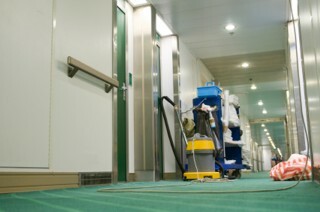 Have you tried contacting your janitorial service and received no response? Do you feel unhappy and stuck in a long term cleaning contract?